The Library is 75 feet (23 m) by 25 feet (7.6 m), and is located to the east of the Music Room. The room that this replaced was originally built in 1742-43 as the Ball Room. In 1766 the East Gallery, as it had become, was subdivided into a Drawing Room of three bays at the west end with a larger Dining Room being created to the east. In 1792-94 it was converted back into a single room and was fitted out as a Library. The plaster ceiling in its present form is thought to date from then, with its deep coffered cove in each corner of which are clusters of grapes, the flat centre of the ceiling has elaborate decoration, including in the border of the central panel mermen holding and feeding a griffin. The main entrance to the room is in the centre of the long north wall. There are chimneypieces in the centre of each end wall, these are of white marble with flanking caryatids, the jambs are of black marble, one dates from 1792 which is a copy of the other probably dating from the 1760s. Above each chimneypiece is a mirror. When the Gothic Library was added in 1805 this room was distinguished as the Large Library. The bookcases are of mahogany there are over five hundred shelves on the lower walls and they have their original doors with brass wire grilles. The walls are complete covered by the shelving, even the walls between the seven windows of the south wall. 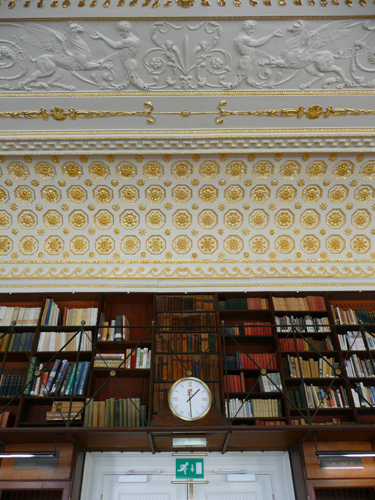 The upper two hundred and forty shelves are accessed via a gallery running around the east, north and west walls. By 1817 the Large Library contained 20,000 volumes of printed books. However, hearing of the financial difficulties of the 2nd Duke, Thomas Grenville left it to the British Museum. 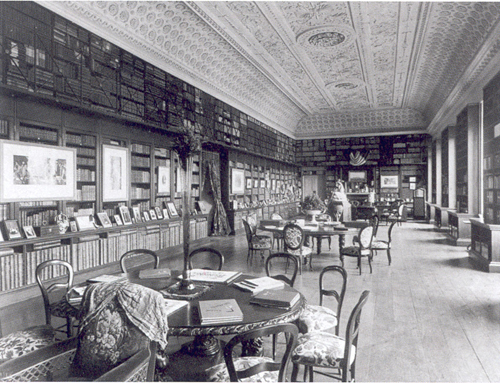 The Duke’s library was sold in January 1849 at Sotheby’s and by 1871 the Large Library was in use as a Billiard Room. There are a series of three marble busts in the windows that were sold from the house in 1921 but have been repurchased, these are: 1st Duke of Buckingham and Chandos by Raimondo Trentanove, Frederick III, German Emperor and Victoria, Princess Royal both carved by Tito Angelini. There are also small busts above the bookcases on the window wall, Homer, Francis Bacon, Isaac Newton, Horace, Demosthenes and another of Homer. These were sold in 1921 but donated to the House and returned to their original positions. 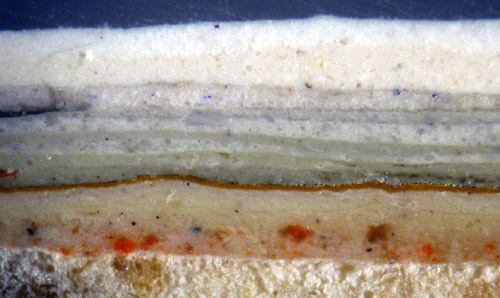 Cross Section of Paint from a Plaster Rosette. An analysis of the paint has shown that throughout its existence the woodwork in this room has been painted in a pale stone colour or off-white. Similarly, a pale stone-coloured oil paint was employed on the walls until the early nineteenth century. In about 1766 the room was split in two and gilding was introduced to the coffer borders at both ends, although the paint finish was subtly different in each half. 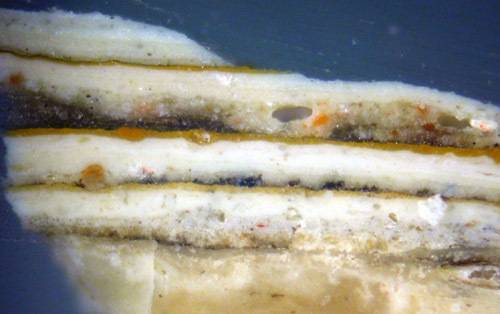 Cross Section of Paint from the Egg and Dart Moulding of the Coffer Border. 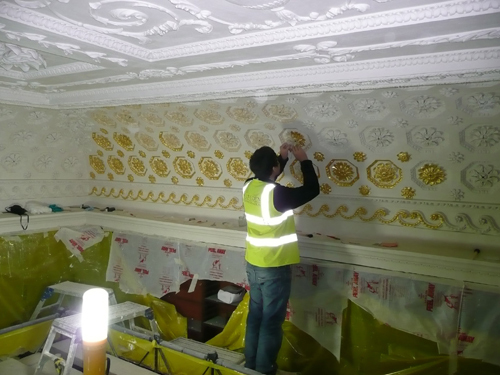 The fourth scheme saw the coffer borders re-gilded and gold applied to the cornice in the west end but the earlier gilding was over-painted in the east end. 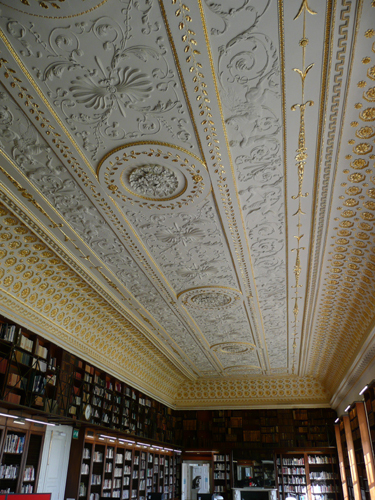 In about 1792-94 the room was returned to its original shape and plaster rosettes and florets were introduced to the ceiling – before that time the coffers were plain. The Neoclassical central decorative plaster panel and the vine leaf details in the corners were added. An off-white oil paint was applied overall. There was no gilding at this stage. The sixth scheme marks, perhaps, the highest point in terms of the decorative history of the room. A small amount of green was introduced into some of the coffer beds and ceiling panels and extensive gilding was employed. It is unclear whether this dates from 1798-99 or 1805-07. The walls were painted in the red-brown colour that survives in the back of the bookcases, which were installed at this time. This is the scheme that has been reproduced. Subsequently the ceiling seems to have been painted in fairly uniform off-whites, while the walls continued to be painted in pale stone colours and the woodwork in off-whites. Here is a slideshow showing some of my work on the ceiling.